The Waterloo Record reports that Titanic:The Artifact Exhibition will be coming to Kitchener in September at The Museum (formerly the Waterloo Regional Children’s Museum). It runs from 23 Sep 2010-23 Jan 2011. Further information can be found at www.thechildrensmuseum.ca. Top Chef has returned to Bravo. Hopefully it will push aside those crazy gals from New Jersey (we get it Danielle, you hate the Manzo family). Meanwhile Top Chef puts its cheftestants through the paces to find out who are just okay, good, and very good. I have decided to repost my rules for Top Chef. It is basically a set of rules the cheftestants ought to consider before serving any dish and derived from watching the show over the past few years. So here it is. The rules are in no particular order and new additions are noted. It is a fact that on Top Chef that those who go to culinary school usually do much better than those who do not. The reason is that most cooking schools, especially the well known ones, teach a lot of important techniques that being self-taught you might miss out on. A self taught chef can produce good food but is at a serious disadvantage to someone who has mastered the art and cooks like it is served in a fine upscale restaurant. 2. Never Over Salt! Ever! Perhaps one of the biggest hits on a dish is to make it too salty. In most cases, it is a death sentence for the chef who prepared it. Usually they ask if you knew it was too salty. If you answer no, they question your palate. If you answer yes, they question why you sent out the dish in the first place. Either way it is bad and puts you on the top of the list to be eliminated. 3. Light touch on seasoning fine; Under seasoning bad. If too much salt is bad, under seasoning a dish is just as bad. The result is bland tasting food that just needs that extra dash of something to zing it up. It is not as bad as oversalting a dish but if it is combined with lackluster presentation and food that ought to have been better, your now on the list to be eliminated. 4. Do not make something you have never done before. One thing that sinks aspiring cheftestants is deciding to cook something they have never done before. Unless you are familiar with the ingredients, it is best you stick with what you know. Otherwise expect the judges to be very tough in making you defend the dish if it turns out wrong. This would seem obvious but many cheftestants forget this basic rule and end up on the bottom. It is your last chance to correct something amiss before it ends up before a judge. 6. Check your food for doneness. Serving raw seafood (unless sushi or a cerviche), raw poultry, or too rare a meat will get you a fast ticket to the bottom. Likewise overcooking will end you at the bottom as well. Never assume it is cooked right by merely looking at it. 7. Avoid complicated dishes unless you tie it all together. All the components of a dish must go together. Do not, repeat do not, just throw things together and hope for the best. Judges will zing you hard for this and worse if it tastes bad. 8. Never put something on the plate unless it relates to the other components. One thing that trips up a cheftestant is putting something on the plate that simply does not belong there. Slices of cheese or fruit ought to complement not stick out like a sore thumb. 9. Avoid funky or strange combinations UNLESS you know how to make it work right. Butterscotch, peanut butter, strong cheeses have been the death knell for a dish and the chef who prepared it. Even if you know how to do it perhaps it would be best to let it pass on this show. Judges are finicky and picky about what they like and dislike. Certain sweet and peanut dishes are good dishes in their homeland but not necessarily in the Top Chef dining room. 10. The Classics Trap: Your dish must recall the original. Top Chef often asks its cheftestants to take a classic dish and make it something new. What this requires is ingenuity and skill to remake or update it. Remember though it has to hearken back to the classic dish. This is especially true if you have to deconstruct it. All the components of your dish must line up with the original in some way. 11. Crispy good, soggy bad. This has been the doom of many a meal on Top Chef. When the dish, like a corn dog, has to sealed up and taken elsewhere to be served the risks of it going soggy are high. Steaming occurs while it is enclosed making your once crispy food soggy. Failing to understand this bit of food science will put you high on the list to be sent home. 12. Make sure the dish you serve is as advertised. A few seasons back one of the cheftestants cooked Coq au Vin. The judges all loved it but there was a problem: it was not Coq au Vin. The dish requires a rooster not just a regular chicken to be served. And since many of the judges were classically trained French chefs and knew what the dish was, they had to give the win to another cheftestant. Likewise one cheftestant called his salad “Waldorf” but the judges pointed out it was not even close to the classic (and not very good either). 13. Overconfidence and arrogance is a dangerous combination. It seems almost a Top Chef axiom: those that are overconfident and arrogant end up tripping up along the way. Thankfully (as far as we know) this has not been a large issue. However it goes without saying that if the judges see you being unsanitary in food preparation or serving they will zing you for it. 15. When cooking food that is a local specialty, make it fresh. Chicago is known for its sausage. So if you are going to wow the judges and others, you have better make some delicious sausage of your own. Relying on store bought varieties, while safe, will not impress the judges who expected something more. 16. Never serve under rested meat. The proper resting of meat and poultry is important to insure that flavor does not run out when you cut into it. There is perhaps nothing more sad than to see a perfectly good piece of meat ruined by not properly resting it. There is also a corollary to this: always slice your meats with the proper knife and make sure you do it evenly. 17. Never butcher an already tender cut of meat. Taking a tender lamb, for instance, and then butchering and cooking it wrong will infuriate the judges and send you home for wasting a perfectly good piece of meat. If not required to have either wine or alcohol as part of your dish, skip it. Sometimes it can work in your favor or add little to the dish. Worse is when the drink is so bad that even if the dish was good it sends you to Judge’s Table where they examine you for sanity. 19. Do not try to fool the judges by mixing cooked with undercooked! Simply put, you are an idiot for trying this. If you think that mixing undercooked potatoes with fully cooked mashed potatoes will not be noticed, you deserve to go home for such a bonehead move. 20. “The oven was not working right” and other excuses. Most professional chefs have had kitchen equipment go down on them. When it happens, they improvise around it. If your food was over or undercooked due to bad ovens, burners or anything but a genuine power outage it will not cut you much slack with the judges. They can all recite experiences of their own and how they got around it in a pinch (and served the meal to the delight of everyone). 21. Never say that you do not understand what you did wrong at Judges Table. It will simply convince them you do not belong on Top Chef and send you home. 22. In Restaurant Wars the winners usually produce high quality food because they organize themselves and make sure food is done right. The losers usually are poorly organized and there is no quality check. 23. Be sure whoever is front of the house in Restaurant Wars is comfortable in the roll of seating people, answering their questions, and handling problems. Or you will regret it later at Judges Table. 24. Fresh fish good, frozen bad. When cooking for an upscale crowd, avoid using frozen seafood in entrees. Never cook a dessert you are not familiar with. And never make it so sweet that the essential component is lost. Do not rely on store bought components (like pastries, ice cream, or other prepared items) as a part of your dish. Reuters is reporting that Sellers Capital, which has a 46% stake in Premier Exhibitions, has stated it will be selling its position. The reason is that Sellers is facing increased redemption demands and needs to return the capital to its investors. Premier states it is “assessing strategic alternatives” which means it is trying to figure out to handle the sale. Sellers wants to sell its share to a buyer committed to preserving the Titanic artifacts as represented to a Federal court judge in a hearing last year. The problem, I suspect, is finding an investor (or a group of them) who wants to sink money into this company. Premier handles many exhibitions and Titanic is one of them. An additional problem yet unanswered is the final disposition on the aritifacts. Premier Exhibitions does not own them but is the legal sucessor to the company that did the salvage, RMS Titanic Inc. That company was awarded salvor-in-possession status, not outright ownership of the artifacts. And a federal judge put restrictions on how those artifacts can be used. Premier has filed a motion with the federal court to grant them a salvage award allowing them to sell the artifacts. A ruling has not been made. Of course there is the possibility of government action. The U.S. government might declare an interest in the matter saying it is of great historical value and use its powers to take them out of Premier’s hands. All of this uncertainty is not something that will attract investors unless they have lots of money to burn. It is quite possible investors from the Middle East or Asia might well end up buying the share. The helmsman of the Titanic was advised of a small ice flow off the bow. Not to worry. This ship is unsinkable. So we think of the governments of the United States. We best think again. Our politicians make P.T. Barnum and Bernie Madoff appear as two-bit rank amatuers. Unless, of course, you believe that White Star Line switched Titanic for Olympic to collect insurance money (and it went horribly wrong). There have several Titanic cliches in the past few days. Time to give them their due! “Symbian is a great platform, but it’s also huge. It’s the Titanic of mobile operating systems… lets hope it doesn’t suffer the same fate,” said Hal Steger, vice president of marketing at Funambol, which provides an open-source server-side platform used to synchronise data on mobile devices and PCs with Web-based services. Titanic is to Symbian as water is to ice? “I think Salazar is basically rearranging the chairs on the deck of the Titanic,” Babbitt, who served as secretary for eight years under Bill Clinton, told Platts Energy Week. Not very original. I wish I had a dime for every time the “rearranging deck chairs” cliche is used. A former Southern Baptist president, Rev. James Merritt, compared the denomination’s present course to the Titanic sailing into an iceberg. “We’ve been sitting on our deckside lounges, watching this ship sail into the iceberg of declining baptisms, diminishing missions, and what is becoming a dead orthodoxy,” he stated. Ending offshore drilling because of this oil spill would be like ending shipping because the Titanic hit an iceberg. At least that uses Titanic in a meaningful way rather than as a cliche. Bravo to Jesse Kline for proving you can use Titanic without a cliche. A few weeks ago I wrote about Ben Goldsmith and his fiancée Amanda Warrix entering a contest to have their marriage at COSI’s Titanic replica. The Mansfield News Journal reports they won the online competition. Readers will also recall that Ben Goldsmith is the great-great-grandson of Titanic survivor Frank Goldsmith, Jr. In addition to winning the contest, COSI is also paying for a honeymoon at the Sandals resort in The Bahamas. We wish the couple all the best. This “Titanic” Did Not Dock Either! The Spanky’s Courthouse Café team equipped its homemade pontoon boat with a small plastic waterslide and a stereo system that blasted 80s heavy metal music while team members lounged on lawn chairs with a drink cooler while wearing Hawaiian leis. The team, which consisted of Brandon Ruiz, Jason Peters, Gary Shaffner and Preston Rauch, all of Clearfield, took home the surprise “Titanic” award for not reaching the finish line. Pontoon, small plastic waterslide, heavy metal music and lounging on lawn chairs in Hawaiian leis sipping a cold one. One can see where that might end up not quite making it. The Mullet Madness (!) team wearing large mullet wigs on a pontoon floated by empty beer kegs and towing a long train of inflatable pink flamingos behind them overcame obstacles to cross the line. Occasionally the pink flamingos would separate requiring an assist by the fire department rescure boat. According to New York Observer, Governor Patterson is on the attack against a fellow Democrat in the state senate. Senate Majority Leader Espada has stated that he would not vote for cuts that are slipped into weekly emergency budget extenders. This caused Paterson to throw some verbal bombs and naturally Titanic was invoked. The imagery conveyed is odd. Is he trying to compare Espada to the Titanic musicians who played until the final moments? They are considered heroes and all perished . Or is Paterson trying to say Espada is a foolish one note musician about to be swallowed up by the sea (the sea, in this case a political one)? An odd way to use a cliche and quite muddy in meaning. One could argue that Paterson wants Espada to drown (metaphorically speaking). Paterson gets our Tacky Titanic Award For Clumsy Use of Cliche. Titanic Comment of Day: Devo Like Titanic Band! The NJSEA says it has cut $1.3 million from its payroll, but that’s like throwing a deck chair off the Titanic. 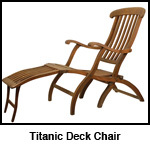 Of course if you do have a real deck chair from Titanic (presumably retrieved as debris in 1912), that would be worth serious money. Probably not enough though to solve the budget problems NJSEA faces.